Teerna Bhattacharya and R. Sowdhamini (2019) Genome-Wide Search for Tyrosine Phosphatases in The Human Genome through computational approaches leads to the discovery of few new domain architectures. Evolutionary Bioinformatics (in press). Pritha Ghosh, Teerna Bhattacharya, Oommen K. Mathew and R. Sowdhamini (2019) PASS2 version 6 a database of structure based sequence alignments of protein domain superfamilies in accordance with SCOPe. Database (in press). Jayashree S, Murugavel P, Sowdhamini R, Srinivasan N. (2019) Interface residues of transient protein-protein complexes have extensive intra-protein interactions apart from inter-protein interactions. Biol Direct. Jan 15;14(1):1. doi: 10.1186/s13062-019-0232-2. Atul Upadhyay and R. Sowdhamini (2018) Genome-wide analysis of domain-swap predicted products in the genome of anti-stress medicinal plant: Ocimum tenuiflorum. Bioinformatics and Biology Insights (in press). Iyer MS, Joshi AG, Sowdhamini R. Genome-wide survey of remote homologues for protein domain superfamilies of known structure reveals unequal distribution across structural classes. Mol Omics. 2018 Aug 6;14(4):266-280. doi: 10.1039/c8mo00008e. Chandrika Bendigiri, K. Harini, Sajal Yenkar, Smita Zinjarde, R. Sowdhamini and Ameeta RaviKumar. Evaluating Ylehd, a recombinant epoxide hydrolase from Yarrowia lipolytica as a potential biocatalyst for the resolution of benzyl glycidyl ether. RSC Adv., 8, 12918-12926. Jarjapu Mahita and Ramanathan Sowdhamini. Probing subtle conformational changes induced by phosphorylation and point mutations in the TIR domains of TLR2 and TLR3. Proteins, (2018), https://doi.org/10.1002/prot.25471. Jarjapu Mahita and Ramanathan Sowdhamini. Investigating the effect of key mutations on the conformational dynamics of toll‐like receptor dimers through molecular dynamics simulations and protein structure networks. Proteins, (2018), 86 (4): 475-490. Binnu Gangadharan, Margaret S. Sunitha, Souhrid Mukherjee, Ritu Roy Chowdhury, Farah Haque, Narendrakumar Sekar, Ramanathan Sowdhamini, James A. Spudich and John A. Mercer. Molecular Mechanisms and Structural Features of Cardiomyopathy-Causing Troponin T Mutants in the Tropomyosin Overlap Region. PNAS, (2017), 114(42):11115-11120. doi: 10.1073/pnas.1710354114. Snehal Karpe, Surbhi Dhingra, Axel Brockmann and Ramanathan Sowdhamini. Computational genome-wide survey of odorant receptors from two solitary bees Dufourea novaeangliae (Hymenoptera: Halictidae) and Habropoda laboriosa (Hymenoptera: Apidae) Scientific Reports 7(1):10823. Pritha Ghosh and Ramanathan Sowdhamini. Bioinformatics comparisons of RNA-binding proteins of pathogenic and non-pathogenic Escherichia coli strains reveal novel virulence factors. BMC Genomics, (2017) 18:658. Jarjapu Mahita and Ramanathan Sowdhamini. Integrative modelling of TIR domain-containing adaptor molecule inducing interferon-Î² (TRIF) provides insights into its auto-inhibited state. (2017) Biology Direct, 12:9. Sneha Vishwanath, Anshul Sukhwal, Ramanathan Sowdhamini and Narayanaswamy Srinivasan. Specificity and stability of transient protein-protein interactions. (2017) Curr. Opin. Struc. Biol., 44, 77-86. Pritha Ghosh, Oommen K. Mathew and Ramanathan Sowdhamini. RStrucFam: a web server to associate structure and cognate RNA for RNA-binding proteins from sequence information. (2017) BMC Bioinformatics, 17, 411. Karpe, SD, Jain R, Brockmann, A and Sowdhamini R. Identification of complete repertoire of Apis florea odorant receptors reveals complex orthologous relationships with Apis mellifera. (2017) Genome Biology and Evolution, 8, 2879–95. Naseer Pasha, Iyer Meenakshi and Ramanathan Sowdhamini. Revisiting myosin families through large-scale sequence searches leads to the discovery of new myosin families. (2017) Evolutionary Bioinformatics, 12, 201-211. Rajas M Rao, Shaik Naseer Pasha and Ramanathan Sowdhamini. Genome-wide survey and phylogeny of S-Ribosylhomocysteinase (LuxS) enzyme in bacterial genomes. BMC Genomics (2016), 17(1):742. doi: 10.1186/s12864-016-3002-x. Atul Upadhyay and R. Sowdhamini. Genome-wide prediction and analysis of 3D-domain swapped protein in the human genome from sequence information. (2016) PLoS ONE, 11(7): e0159627. Eshita Mutt and R. Sowdhamini, Molecular dynamics and structural analysis to decipher functional impact of a twenty-residue insert in the ternary complex of Mus musculus TdT isoform. (2016) PLoS ONE,11(6): e0157286. Oommen K. Mathew and R. Sowdhamini. PIMAdb: a database of Protein-Protein Interactions in Huge Macromolecular Assemblies. (2016) Bioinformatics and Biology Insights, 10, 105–109. Rithvik S. Vinekar and R. Sowdhamini. Three-dimensional modelling of the voltage gated sodium ion channel from Anopheles gambiae reveals spatial clustering of evolutionarily conserved acidic residues at the extracellular sites. (2016), Current Neuropharmacology, 14. Dhanyalakshmi, K. H., Naika, M. B. N., Sajeevan, R. S., Mathew, O. K., Shafi, K. M., Sowdhamini, R., and N Nataraja, K. An Approach to Function Annotation for Proteins of Unknown Function (PUFs) in the Transcriptome of Indian Mulberry. (2016) PloS One, 11(3), e0151323. Gandhimathi A, Margaret Sunitha S, Pritha Ghosh, Harini K, Subramanian Hariprasanna P, Iyer Meenakshi S, Joshi G, Karpe Snehal D, Jarjapu Mahita, Manoharan Malini, Oommen Mathew K, Eshita Mutt, Mahantesha Naika, Nithin Ravooru, Sathyanarayanan Nitish, Shaik Naseer Pasha, Upadhyayula Raghavender S, Rajas Rao M, Mohamed Shafi K, Prashant Shingate N, Anshul Sukhwal, Atul Upadhyay K, Rithvik Vinekar S and Ramanathan Sowdhamini, Draft Genome of Cissus quadrangularis to elucidate the Medicinal Values. (2016) Herbal Medicine, 2, 1-7. Oommen K Mathew and Ramanathan Sowdhamini. PIMA: Protein-protein interactions in huge macromolecular assembly visualization and analysis web server. (2016) Bioinformation, 12(1): 9-11. Sankaran Sandhya, Richa Mudgal, Gayatri Kumar, Ramanathan Sowdhamini and Narayanaswamy Srinivasan, Protein sequence design and its applications. (2016) Current Opinion in Structural Biology, 37:71-80. Pritha Ghosh and Ramanathan Sowdhamini. Genome-wide survey of putative RNA-binding proteins encoded in the human proteome. (2016) Mol. BioSyst., 12, 532–540. Pankaj Barah, Mahantesha Naika, Naresh Jayavelu, Ramanathan Sowdhamini, Khader Shameer and Atle Bones. Transcriptional regulatory networks in Arabidopsis thaliana during single and combined stresses. (2016) Nucleic Acids Research, 44(7):3147-64. A.Gandhimathi, Pritha G.,Sridhar H.,Oommen .K.Mathew and R. Sowdhamini. (2016). Nucleic Acids Research, 44, D410-4. Lakshmi .B, Ramakrishnan,C., Archunan,G., Sowdhamini,R and Srinivasan,N. (2014). Investigations of Ramachandran disallowed conformations in protein domain families. Int.J.Biol.Macromol. 63:119-125. N.Srinivasan, R.Sowdhamini and Alok Bhattacharya. (2007). Computational biology:More than just a set of techniques. J.Biosci.32:(1),1-2. Pritha Ghosh, Sushma Nagaraja Grellscheid and R. Sowdhamini. A Tale of Two Paralogs: Human Transformer2 proteins with differential RNA-binding affinities. Journal of Biomolecular Structure and Dynamics, 1102, 1–8. Swati Kaushik, Anu G Nair, Eshita Mutt, Hari Prasanna and Ramanathan Sowdhamini. (2015) Rapid and Enhanced Remote Homology Detection by Cascading Hidden Markov Model searches in Sequence Space. Bioinformatics, 32(3):338-44. Jarjapu Mahita, K. Harini, Mallikarjuna Rao Pichika and Ramanathan Sowdhamini. (2015). An in-silico approach towards the identification of novel inhibitors of the TLR-4 signaling pathway. Journal of Biomolecular Structure and Dynamics. (in press). A. Gandhimathi and R.Sowdhamini. (2015). Molecular modelling of human 5-hydroxytryptamine receptor (5-HT2A) and virtual screening studies for the identification of new agonist and antagonist molecules.Journal of Biomolecular Structure and Dynamics. (in press). Atul K. Upadhyay, Anita R. Chacko, A. Gandhimathi, Pritha Ghosh, K. Harini, Agnel P. Joseph, Adwait G. Joshi, Snehal D. Karpe, Swati Kaushik, Nagesh Kuravadi, Chandana S Lingu, J. Mahita, Ramya Malarini, Sony Malhotra, Manoharan Malini, Oommen K. Mathew, Eshita Mutt, Mahantesha Naika, Sathyanarayanan Nitish, Shaik Naseer Pasha, Upadhyayula S. Raghavender, Anantharamanan Rajamani, S Shilpa, Prashant N. Shingate, Heikham Russiachand Singh, Anshul Sukhwal, Margaret S. Sunitha, Manojkumar Sumathi, S. Ramaswamy, Malali Gowda and Ramanathan Sowdhamini. (2015). Genome sequencing of herb Tulsi (Ocimum tenuiflorum) unravels key genes behind its strong medicinal properties. BMC Plant Biology. 15:212. doi: 10.1186/s12870-015-0562-x. Rahul Metri, Sridhar Hariharaputran, Gayatri Ramakrishnan, Praveen Anand, Upadhyayula S. Raghavender, Bernardo Ochoa-Montaño, Alicia P. Higueruelo, Ramanathan Sowdhamini, Nagasuma R. Chandra, Tom L. Blundell and Narayanaswamy Srinivasan. (2015). SInCRe - Structural Interactome Computational Resource for Mycobacterium tuberculosis. Database.(accepted). Manoharan Malini, Sayyed Auwn Muhammad and Ramanathan Sowdhamini. (2015).Sequence Analysis and Evolutionary Studies of reelin domains. Bioinformatics and Biology Insights.(accepted). Upadhyayula Surya Raghavender and R. Sowdhamini. (2015) Mechanistic Basis Of Peptide-Protein Interaction In AtPep1-PEPR1 Complex In Arabidopsis thaliana. Peptide and Protein Letters (accepted). Anshul Sukhwal and R. Sowdhamini. (2015) PPCheck : a webserver for the quantitative analysis of protein-protein interfaces and prediction of residue hotspots. Bioinformatics and Biology Insights. 9, 141–151. doi:10.4137/BBI.S25928. Prashant Shingate, Jim Warwicker and R. Sowdhamini. (2015).Energetic calculations to decipher pH-dependent oligomerization and domain-swapping of proteins. PLoS One (in press). Sony Malhotra and R. Sowdhamini. (2015).Collection and analysis of DNA-binding protein domain families from sequence and structural databases.Molecular BioSystems (in press). Gayatri Ramakrishnan, Bernardo Ochoa-Montano, Upadhyayula S. Raghavender, Richa Mudgal, Adwait G. Joshi, Nagasuma R. Chandra, Ramanathan Sowdhamini, Tom L. Blundell and Narayanaswamy Srinivasan (2015) Enriching the annotation of Mycobacterium tuberculosis H37Rv proteome using remote homology detection approaches: Insights into structure and function. Tuberculosis 95 (2015) 14e25. Sony Malhotra and R. Sowdhamini (2015) Sequence search and analysis of gene products containing RNA recognition motifs in the human genome. BMC genomics (in press). Khader Shameer, Mahantesha Naika BN, Oommen K. Mathew and Ramanathan Sowdhamini.(2014). POEAS:Automated Plant Phenomic Analysis using Plant Ontology. Bioinformatics and Biology Insights 2014:8 209-214. Swati Kaushik and Ramanathan Sowdhamini.(2014). Distribution, Classification, Domain Architecture and Evolution of Prolyl Oligopeptidases in Prokaryotic Lineages.BMC Genomics 2014 Nov 18;15(1):985. Prashant Shingate,Malini Manoharan, Anshul Sukhwal and Ramanathan Sowdhamini. (2014). ECMIS: computational approach for the identification of hotspots at protein-protein interfaces. BMC Bioinformatics. 15:303. Mudgal R, Sandhya S, Kumar G, Sowdhamini R, Chandra NR and Srinivasan N. (2015) NrichD database: sequence databases enriched with computationallydesigned protein-like sequences aid in remote homology detection. Nucleic Acids Res. 43 (Database issue): D300-5. Sony Malhotra and R. Sowdhamini (2014) Interactions among plant transcription factors regulating expression of stress-responsive genes. Bioinform Biol Insights. 2014; 8: 193–198. Akhilandeswarre Dharmaprakash, Eshita Mutt, Abdul Jaleel, Sowdhamini R, Sabu Thomas (2014) Proteome profile of pandemic Vibrio parahaemolyticus SC192 strain during planktonic and biofilm condition. Biofouling 2014;30(6):729-39. Agnel P. Joseph, Prashant Shingate, Atul Upadhyay and R. Sowdhamini. (2014) 3PFDB+: Improved search protocol and update for identification of representatives of protein sequence domain families. Database (Oxford). 2014 Apr 3;2014:bau026. B. Nagarathnam, Snehal D. Karpe, K. Harini, Kannan Sankar, Mohammed Iftekar, D. Rajesh, S. Giji, G. Archunan, V. Balakrishnan, M. Gromiha, W. Nemoto, K. Fukui and R. Sowdhamini. (2014) DOR- A Database of Olfactory Receptors- integrated repository for sequence and secondary structural information of olfactory receptors in selected eukaryotic genomes. Bioinformatics and Biology Insights 2014:8 147-158 . Anita Rachel Chacko, Oommen K. Mathew, Adwait Joshi, Upadhyayula Surya Raghavender and R. Sowdhamini. (2014) SMOS.2: Update of database of structural motifs in superfamilies. Nucleic Acids Research, Database Issue, Jan. 2014. Anita Chacko, Shankarrao Patil, Atul Upadhyay, Deepak Arya, Ashwat Nagrajan, Rakesh Khatri, Sudhir Krishna, Ramanathan Sowdhamini, Cecil Ross and Rajesh Behl (2013) A high throughput exome sequencing approach to analyse events within a good responder CML patient under imatinib at diagnosis and under remission. Blood October 21, 2013 vol. 122 no. 21 5161. Swati Kaushik, Catherine Etchebest and R. Sowdhamini (2013) Decoding the structural events in substrate-gating mechanism of eukaryotic prolyl oligopeptidase using normal mode analysis and molecular dynamics simulations. Proteins 2014; 82:1428–1443. Richa Mudgal, Ramanathan Sowdhamini, Nagasuma Chandra, N Srinivasan and Sankaran Sandhya (2013) Filling-in void and sparse regions in protein sequence space by protein-like artifical sequences enables remarkable enhancement in remote homology detection capability. J Mol Biol. 2014 Feb 20;426(4):962-79. Eshita Mutt, Oommen K. Mathew and R. Sowdhamini (2013) LenVarDB: Database of length-variant protein domains. Nucleic Acids Res. 2014 Jan;42(Database issue):D246-50. Sony Malhotra and R. Sowdhamini (2013) Structural interface parameters are discriminatory in recognising near-native poses of protein-protein interactions. PLoS ONE 9(2): e80255. Eshita Mutt, Sudha S Rani, Ramanathan Sowdhamini (2013) Structural updates of alignment of protein domains and on sequences on evolutionary models of domain superfamilies. BioData Min. 2013 Nov 15;6(1):20. Gandhimathi A., Anu Nair, Hariharaputran S. and Sowdhamini R. (2013) Rebelling for a reason: Protein structural "outliers". PLoS ONE 8(9):e74416. Manoharan Malini, Fuchs Patrick F.J., Ramanathan Sowdhamini and Offmann Bernard (2013) Insights on pH-depenedent conformational changes of mosquito odorant binding proteins by molecular dynamics simulations. J Biomol Struct Dyn. 2014;32(11):1742-51. Mahantesha Naika, Khader Shameer and Ramanathan Sowdhamini (2013) Comparative analyses of stress-responsive genes in Arabidopsis thaliana: Insights from genomic data mining, functional enrichment, pathway analysis and phenomics. Mol. BioSyst.,9(7), 1888-1908. Sony Malhotra and Ramanathan Sowdhamini (2013) Genome-wide survey of DNA-binding proteins in Arabidopsis thaliana:analysis of distribution and fuctions. Nucleic Acids Research; doi:10.1093/nar/gkt505. Adwait Govind Joshi, Upadhyayula Surya Raghavender and Ramanathan Sowdhamini. (2013) Improved performance of sequence search algorithms in remote homology detection. f1000 Research doi: 10.12688/f1000research.2-93.v1. Anshul Sukhwal and R. Sowdhamini. (2013) Oligomerisation status and evolutionary conservation of interface of protein structural domain superfamilies. Molecular BioSystems 2013,9, 1652-1661. Swati Kaushik, Eshita Mutt, Ajithavalli Chellappan, Sandhya Sankaran, Narayanaswamy Srinivasan and Ramanathan Sowdhamini. (2013) Improved detection of remote homologues using Cascade PSI-BLAST: influence of neighbouring protein families on sequence coverage. PLoS ONE 8(2):e56449. Manoharan Malini, Kannan Sankar, Offmann Bernard and Sowdhamini Ramanathan (2013) Association of putative members to mosquito odorant binding proteins: Scoring scheme using Fuzzy Functional Templates and Cys residue positions. Bioinform Biol Insights. 2013 Jul 22;7:231-51. Divya P. Syamaladevi, Adwait Joshi and Ramanathan Sowdhamini (2013) An Alignment-free Domain Architecture Similarity Search (ADASS) algorithm for inferring homology between multi-domain proteins. Bioinformation 9 (10): 491-499. Mahantesha Naika, Khader Shameer, Ramanjini Gowda and Ramanathan Sowdhamini in the book entitled "Molecular Approaches for Abiotic Stress" edited by R. K. Gaur and P. Sharma (Centre for Agricultural Bioscience International Press, U.K.). 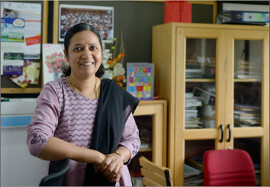 M. Malini, N.F.C. Matthieu, V. Aurore, F. Etienne, R. Sowdhamini and B. Offmann. (2012) Comparative genomics of odorant binding proteins in Anopheles gambiae, Aedes aegypti and Culex quinquefasciatus. Genome Biology and Evolution 5 (1) : 163-180. Mahantesha Naika, Khader Shameer, Oommen K. Mathew , Ramanjini Gowda and Ramanathan Sowdhamini. (2012) STIFDB2: An updated version of plant Stress Responsive TranscrIption Factor DataBase with additional stress singnals, stress responsive transcription factor binding sites and stress responsive genes in Arabidopsis and rice. Plant and Cell Physiology Plant Cell Physiol. 2013 Feb;54(2):e8. doi: 10.1093/pcp/pcs185. Prashant Shingate, Atul K. Upadhyay, U.S. Raghavender and R. Sowdhamini. (2012) Identification and Conformational Analysis of hinge regions in proteins that undergo domain swapping. To appear as a Chapter in a book entitled “Biomolecular Forms and Functions” (Eds. M. Bansal and N. Srinivasan). Divya P. Syamaladevi, Margaret Sunitha, S. Kalaimathy, Chandrashekar Chilamakuri Reddy, Mohammed Iftekhar, Naseer Shaik Pasha and R. Sowdhamini. (2012) Myosinome: A database of myosins from select eukaryotic genomes to facilitate analysis of sequence-structure-function relationships. Bioinformatics and Biology Insights Volume 6: 247-54. Margaret S Sunitha, Anu G Nair, Amol Charya, Kamalakar Jadhav, Sami Mukhopadhyay and Ramanathan Sowdhamini (2012) Structural attributes for the recognition of weak and anomalous regions in coiled-coils of myosins and other motor proteins. BMC Research Notes 5(1):530. Harini Krishnan, Sankar Kannan, Waturu Nemoto, Kazuhiko Fukui and Sowdhamini, R. (2012) Residue conservation and dimer-interface analysis of olfactory receptor molecular models :100 OR models for the molecular biochemists. Journal of Molecular Biochemistry (2012)1,161-170. Margaret Sunitha S, John A. Mercer, James A. Spudich and Ramanathan Sowdhamini (2012) Integrative structural modelling of the cardiac thin filament: energetics at the interface and conservation patterns reveal a spotlight on period 2 of tropomyosin. Bioinformatics and Biology Insights 6:203-23. S. Sandhya, R. Mudgal, C. Jayadev, K. R. Abhinandan, R. Sowdhamini, N. Srinivasan (2012) Cascaded walks in protein sequence space: Use of artificial sequences in remote homology detection between natural proteins. J. Mol. BioSystems 8(8):2076-84. M. Michael Gromiha, K. Harini, R. Sowdhamini and Kazuhiko Fukui (2012). Relationship between amino acid properties and functional parameters in olfactory receptors and discrimination of mutant with enhanced specificity. BMC Bioinformatics 13(Suppl 7):S1 doi:10.1186/1471-2105-13-S7-S1. A. Gandhimathi, Anu G. Nair, R. Sowdhamini. (2012) Comparison of structure based sequence alignment programs for protein domain super-families with multiple members. Advances in Computing 2012, 2(2): 23-28. B Nagarathnam, S Kalaimathy, V Balakrishnan and Ramanathan Sowdhamini (2012) Cross-genome clustering of human and C. elegans G-protein coupled receptors. Evolutionary Bioinformatics 2012:8 229-259. Khader Shameer and R. Sowdhamini (2012) Functional repertoire, molecular pathways and diseases associated with 3D domain swapping in the human proteome. Journal of Clinical Bioinformatics 2012, 2:8. Harini, K. and Sowdhamini, R. (2012) Molecular modelling of oligomeric states of DmOR83b, an olfactory receptor in D. melanogaster. Bioinformatics and Biology Insights 2012:6 33-47. Djamel Harbi, Marimuthu Parthiban, Deena M. A. Gendoo, Sepehr Ehsani, Manish Kumar, Gerold Schmitt-Ulms, Ramanathan Sowdhamini, Paul M. Harrison (2012) PrionHome: A Database of Prions and Other Sequences Relevant to Prion Phenomena PloSOne, 10.1371/journal.pone.0031785. Sundaramurthy Pandurangan, Raashi Sreenivasan, Khader Shameer, Sunita Gakkhar and Sowdhamini Ramanathan. (2011) HORBALFRE program : Higher Order Residue Interactions Based Algorithm for Fold Recognition. Bioinformation 7(7):352-359. Shameer Khader and Sowdhamini Ramanathan (2011). SEQ2GO: Function annotation of hypothetical proteins using sequence based filtering and domain composition of intermediate homologs. Moscow Conference on Computational Molecular Biology. July 21-24,2011:300-302. Balasubramanian Nagarathnam, Kannan Sankar, Varadhan Dharnidharka, Veluchamy Balakrishnan, Govindaraju Archunan and Ramanathan Sowdhamini. (2011) TM-MOTIF: an alignment viewer to annotate predicted transmembrane helices and conserved motifs in aligned set of sequences. Bioinformation. 7(5):214-221. Divya P Syamaladevi, S. Kalaimathy, Naseer Pasha, S. Subramonian and R. Sowdhamini. (2011) A three-step validation following genome-wide data mining for myosin family members improves search efficiency. In Procceedings of IEEE ICDM 2011 workshop on Biological Data Mining and its Applications in Healthcare (BioDM). 2011(18):1071-1074. Eshita Mutt, Abhijit Mitraand Ramanathan Sowdhamini (2011) Search for Protein sequence homologues that display Considerable domain variations. International Journal of knowledge Discovery in Bioinformatics, 2 (2), 55-77. Eshita Mutt, Abhijit Mitra and R. Sowdhamini. (2011) Mining protein sequence databases for remote homologues that can display considerable domain length variations. In Procceedings of IEEE ICDM 2011 workshop on Biological Data Mining and its Applications in Healthcare (ICDMW). 2011:1050-1057. Swati Kaushik and R. Sowdhamini. (2011) Structural analysis of prolyl oligopeptidases using molecular docking and molecular dynamics: insights into conformational changes and ligand binding. PLoS One 6(11):e26251. Lalima L. Madan, S. Veeranna, K. Shameer, Chandra Shekhar, R. Sowdhamini and B. Gopal (2011) Modulation of catalytic activity in multi-domain tyrosine phosphatases. PLoS ONE 6(9): e24766. Khader Shameer, Prashant N. Shingate, Manjunath, S.C.P., Karthika, M., Ganesan Pugalenthi, Ramanathan Sowdhamini (2011) 3DSwap: Curated Knowledgebase for proteins involved in 3D domain swapping. Database (2011) 2011. Balasubramanian Nagarathnam, Shankar Kannan, Vardhan Dharnidharka, Veluchamy Balakrishnan, Govindaraju Archunan and Ramanathan Sowdhamini. (2011) Insights from the analysis of conserved motifs and permitted amino acid exchanges in the human, fly and worm GPCR clusters. Bioinformation. 2011; 7(1): 15–20. K. Kanagarajadurai, S. Kalaimathy, P. Nagarajan and R. Sowdhamini. (2011) PASS2: A Database of Structure-based sequence alignments of Proteins Structural Domain Superfamilies. International Journal of Knowledge Discovery in Bioinformatics Journal Volume 2, Issue 4:53-56. Ganesan Pugalenthi, Krishna Kumar Kandaswamy, P. N. Suganthan, R.Sowdhamini, Thomas Martinetz and Prasanna Kolatkar. (2010) SMpred: A support vector machine approach to identify structural motifs in protein structure without using evolutionary information Journal of Biomolecular Structure and Dynamics 2010 Dec;28(3):405-14. S. Kalaimathy, R. Sowdhamini and K. Kanagarajadurai. (2010) Critical Assessment of Structure-based Sequence Alignment Methods at Distant Relationships. Briefings in Bioinformatics 12(2):163-175. Reddy CC, Rani SS, Offmann B, Sowdhamini R (2010). Systematic search for putative new domain families in Mycoplasma gallisepticum genome. BMC Res Notes 12, 3:98. Caroline Koshy, Marimuthu Parthiban, and Ramanathan Sowdhamini (2010). 100ns Molecular Dynamics Simulations to study intramolecular conformational changes in Bax. Journal of Biomolecular Structure and Dynamics 28(1):71-83. Ramalingam Rajkumar, Subramanya Prakash, Govindaraju Archunan and Ramanathan Sowdhamini (2010). Primary Structural Documentation of the Major Urinary Protein of the Indian Commensal Rat (Rattus rattus) Using a Proteomics Platform. Protein and Peptide Letters 17(4):449-57. Rajesh R Thangudu, Malini Manoharan, N Srinivasan, Fraderic Cadet, R Sowdhamini and Bernard Offmann (2008) Analysis on conservation of disulphide bonds and their structural features in homologous protein domain families . BMC Structural Biology 8:55. Pugalenthi G, Tang K, Suganthan PN, Archunan G, Sowdhamini R. (2007) A machine learning approach for the identification of odorant binding proteins from sequence-derived properties . BMC Bioinformatics 8:351. Ambika Shyam Sundar, Susan Mary Varghese, Khader Shameer, Nataraja Karaba,Makarla Udayakumar and Ramanathan Sowdhamini (2008) STIF: Identification of stress-upregulated transcription factor binding sites in Arabidopsis thaliana . Bioinformation 2, 431-437. Padmanabhan Anbazhagan, Meera Purushottam, H. B. Kiran Kumar,Shobana Kubendran, Odity Mukherjee, Samir Kumar Brahmachari,Sanjeev Jain and Ramanathan Sowdhamini (2008)Evolutionary analysis of PHLPP1 gene in humans and non-human primates . Bioinformation 2, 471-474. Kanagarajadurai K. and Ramanathan Sowdhamini (2008) Sequence and structural analyses of interleukin-8-like chemokine superfamily . Insilico Biology 8, 0025. Sandhya S, Pankaj B, Govind MK, Offmann B, Srinivasan N, Sowdhamini R. (2008) CUSP: an algorithm to distinguish structurally conserved and unconserved regions in protein domain alignments and its application in the study of large length variations . BMC Struct Biol. 8:28. Ganesan Pugalenthi, P. N. Suganthan, R. Sowdhamini and Saikat Chakrabarti (2008) MegaMotifBase: a database of structural motifs in protein families and superfamilies . Nucl. Acids Res. 36:D218-21. ** Rhana, R., Sandhya, S., Abhinandan, K.R., Chakrabarthi S, Sowdhamini, R. and Srinivasan, N.(2006) Cascade PSI-BLAST Web server: A remote homology search tool for relating protein domains. Nucl. Acids Res.,34: W143-W146. ** Pugalenthi, G., Shameer, K. Srinivasan, N. and Sowdhamini, R.(2006) HARMONY: a web-server for the assessment of protein structures Nucl. Acids Res., 34: W143-W146 . Pugalenthi.G., Bhaduri, A. and R. Sowdhamini (2006) iMOTdb - a comprehensive collection of spatially interacting motifs in proteins . Nucl. Acids Res., 34 (Database issue): D285-6. Kumar Gaurav, Nitin Gupta and Ramanathan Sowdhamini (2005) FASSM: Enhanced Function Association in whole genome analysis using Sequence and Structural Motifs In Silico Biol. 5, 425-38. Anirban Bhaduri and R. Sowdhamini (2006) Domain architectural census of eukaryotic gene products containing O-protein phosphatases Gene,366, 246-255. Metpally, R.R. and Sowdhamini, R. (2005) Cross genome phylogenetic analysis of human and Drosophila G protein-coupled receptors: application to functional annotation of orphan receptors . BMC Genomics, 6,106. ** Bhaduri, A. & Sowdhamini, R. (2005) Genome-wide survey of prokaryotic O-protein phosphatases. J. Mol. Biol352736-52. Bhaduri, A. & Sowdhamini, R. Diversity of phosphatases: study in bacterial and archael genomes in 'Mathematical Biology : Recent trends' Peeyush Chandra and B.V. Rathish Kumar (Eds) Copyright © 2006 Anamaya Publishers, New Delhi, India. Sandhya, S., Chakrabarti, S., Abhinandan, K.R., Sowdhamini, R. & Srinivasan, N. (2005) Assessment of a rigorous transitive profile based search method to detect remotely similar proteins. J. Bio. Strc. Dyn. 23, 283-98. ** Chakrabarti, S., Anand, P., Bharadwaj, N., Pugalenthi, G. & Sowdhamini, R. (2005) SCANMOT: Searching for similar sequences using simultaneous scan of multiple sequence motifs. Nucleic Acid Research, 33, 274-276. Pugalenthi, G., Archunan, G. & Sowdhamini, R. (2005) DIAL: a web-based server for the automatic identification of structural domains in proteins. Nucleic Acid Research, 33, 130-132. Blaise, M. C., Sowdhamini, R. & Pradhan, N.(2005) Comparative analysis of different competitive antagonists interaction with NR2A and NR2B subunits of N-methyl-D-aspartate (NMDA) ionotropic glutamate receptor. J Mol Model (Online). Pugalenthi, G. Bhaduri, A. & Sowdhamini, R. (2005) GenDiS: Genomic Distribution of Protein Structural Superfamilies . Nucleic Acid Research, 33, D252-D255. Thangudu, R. R., Vinayagam, A., Pugalenthi, G.,Manonmani, A., Offmann, B. & Sowdhamini, R. (2005) Native and modelled disulphide bonds in proteins: Knowledge-based approaches towards structure prediction of disulphide-rich polypeptides . Proteins: Structure Function and Bioinformatics, 58, 866-79. Blaise, M., Bhattacharyya, D., Sowdhamini, R. &Pradhan, N. (2005) Structural Consequences of D481N/K483Q Mutation at Glycine Binding Site of NMDA Ionotropic Glutamate Receptors: A Molecular Dynamics Study . J Biomol Struct Dyn., 22, 399-410. Chakrabarti, S., Bhardwaj, N., Anand, P. &Sowdhamini, R. (2004) Improvement of alignment accuracy utilizing sequentially conserved motifs . BMC Bioinformatics, 5,167-188. Blaise M., Sowdhamini R., Raghu Prasad Rao M. &Pradhan N. (2004): Evolutionary Trace Analysis of Ionotropic Glutamate Receptors and Modeling the Interactions of Agonists with Different NMDA Receptor Subunits . Journal of Molecular Modeling, 10, 305-16. ** Chakrabarti, S. & Sowdhamini, R. (2004) Regions of minimal structural variation among members of protein domain superfamilies : Application to remote homology detection and modelling using distant relationships . FEBS Letters, 569, 31-36. Bhaduri, A., Pugalenthi, G., Gupta, N. &Sowdhamini, R. (2004) iMOT: an interactive package for the selection of spatially interacting motifs. Nucleic Acids Research, W602-W605. Bhaduri, A., Pugalenthi, G. & Sowdhamini, R.(2004) PASS2: an automated database of protein alignments organised as structural superfamilies . BMC Bioinformatics, 5, 35. ** Innis, C.A., Anand, P.A. & Sowdhamini, R.(2004) Prediction of Functional Sites in Proteins using Conserved Functional Group Analysis . J Mol Biol., 337, 1053-1068. Bhaduri, A., Pugalenthi, G. & Sowdhamini, R.(2004) PASS2 Nucleic Acids Research , (http://www3.oup.co.uk/nar/database/summary/275(Web publication). Vinayagam, A., Pugalenthi, G., Rajesh R. &Sowdhamini, R. (2004). DSDBASE - Disulfide Database Nucleic Acids Research ,http://www3.oup.co.uk/nar/database/summary/264(Web publication). Chakrabarti, S., John, J. & Sowdhamini, R. (2004) Improvement of comparative modeling by the application of conserved motifs amongst distantly related proteins as additional restraints . Journal of Molecular Modeling, 10, 69-75. Bhaduri, A. & Sowdhamini, R. (2003) A Genome-wide survey of human tyrosine phosphatases. Protein Engng., 16, 881-8. Chakrabarti, S., Venkataramanan, K. & Sowdhamini,R. (2003) SMoS: A database of Structural Motifs of Superfamilies . Prot. Engng.,16,791-793. ** Bhaduri, A., Ravishankar, R. & Sowdhamini, R.(2004) Conserved spatially interacting motifs of protein superfamilies : Application to fold recognition and function annotation of genome data .Proteins: Structure Function Genetics, 54, 657-70. ** Vinayagam.A., Pugalenthi.G., Rajesh.T &Sowdhamini, R. (2004) DSDBASE: A consortium of native and modelled disulphide bonds in proteins. Nucleic Acids Research, 32, D200-202. ** Sandhya, S., Kishore, S., Sowdhamini, R. &Srinivasan, N. (2003) Effective detection of remote homologues by searching in sequence dataset of a protein domain fold. FEBS Letters, 552,225-30. ** Vinayagam, A., Shi, J., Pugalenthi, G.,Meenakshi, B., Blundell, T.L. & Sowdhamini, R. (2003) DDBASE2.0: Updated Domain Database with Improved Methods for the Identification of Structural Domains. Bioinformatics, 19, 1760-1764. Chakrabarti, S. & Sowdhamini, R. (2003) Potentials of fold recognition methods in structure prediction of homoserine lactone synthases in a book on 'Recent Trends in Bioinformatics<92> (Ed. P. Shanmughavel, MKU, Madurai). Chakrabarti, S. & Sowdhamini, R.(2003) Functional sites and evolutionary connections of acyl homoserine lactone synthases. Prot. Engng., 16, 271-278. Chakrabarti, S., Venkataramanan, K.& Sowdhamini, R. (2003) PASS2: Structural motifs of protein superfamilies. Nucleic Acids Research,http://www3.oup.co.uk/nar/database/summary/275 (web publication). Bhaduri, A.,Krishnaswamy, L., Ullal, G.R., Panicker, M.M. & Sowdhamini, R. (2003) Fold prediction and comparative modeling of Bdm1: a probable a/b hydrolase associated with hot water epilepsy. J. Mol. Model., DOI 10.1007/s00894-002-0102-0 URL: http://dx.doi.org/10.1007/s00894-002-0102-0. **Mallika, V., Bhaduri, A. &Sowdhamini, R. (2002) PASS2: A semi-automated database of protein alignments organised as structural superfamilies. Nucleic Acids Research, 30,284-280. Vinayagam, A. & Sowdhamini, R.(2002) DSDBASE: Native and modelled disulphide bonds in proteins. Nucleic Acids Research,http://www3.oup.co.uk/nar/database/summary/26(Web publication). Mallika, V., Bhaduri, A. &Sowdhamini, R. (2002) PASS2: Protein structural superfamilies. Nucleic Acids Research,http://www3.oup.co.uk/nar/database/summary/275(Web publication). **Pandit, S.B., Gosar, D., Abhiman, S., Sujatha, S., Dixit, S.B., Mhatre, N.S., Sowdhamini, R. & Srinivasan, N. (2002) SUPFAM - Database of potential protein superfamily relationships derived by comparing sequence-based and structure-based families: Implications for structural genomics and function annotation in genomes. Nucleic Acids Research, 30, 289-293. Chakrabarti, S., Bhavana, S., Mallika, V. & Sowdhamini, R. (2002) Protein structural similarities and prediction of protein function. in a book 'Trends in Chemistry' (ed. Srivastava, M.M. )., India. ** Shah, P.K., Buslje, C.M. & Sowdhamini, R. (2001) Structural determinants of binding and specificity in transforming growth factor-receptor interactions. Proteins, 454, 408-420. Shah, P.K. & Sowdhamini, R. (2001) Structural Understanding of the Transmembrane domains of Inositol triphosphate receptors and ryanodine receptors towards calcium channeling. Prot. Engng., 14, 867-874. Pullinger, G.D., Sowdhamini, R. & Lax, A.J. (2001) Localization of the Functional Domains of the Mitogenic Toxin of Pasteurella multocida. Infection & Immunity, 69, 7839-7850. ** Sowdhamini, R., Burke, D.F., Huang, J., Mizuguchi, K., Nagarajaram, H.A., Steward, R.E. & Blundell, T.L. (1998) CAMPASS: A database of structurally aligned protein superfamilies. Structure, 6, 1087-1094. Sowdhamini, R., Burke, D.F., Deane, C.M., Huang, J., Mizuguchi, K., Nagarajaram, H.A., Overington, J.P., Rufino, S.D., Srinivasan, N., Steward, R.E. & Blundell, T.L. (1998) Protein 3D structural databases: domains, structurally aligned homologues and superfamilies. Acta Cryst. D, 54, pp.1168-1177. Chirgadze, D.Y., Hepple, J., Byrd, R.A., Sowdhamini, R. & Blundell, T.L. (1998) Insights into the structure of hepatocyte growth factor scatter factor (HGF/SF) and implications for receptor activation. FEBS Letts., 430, 126-129. ** Sowdhamini, R., Mitchell, T., Andrew, P. & Morgan, P. (1997) Structural and functional analogy between pneumolysin and aerolysin. Prot. Engng., 10, 207-215. ** Sowdhamini, R., Rufino, S.D. & Blundell, T.L. (1996) A database of globular protein structural domains: clustering of representative family members into similar folds. Folding and Design, 1, 209-220. Rufino, S.D., Srinivasan, N., Sowdhamini, R., Murray-Rust, J., Donate, L.E., May, A.C.W., Guruprasad, K., Dhanaraj, V., Sibanda, B.L. & Blundell, T.L. (1995) Structure-based design of proteins: Learning from evolution by comparative analysis of protein families. Proc. Ann. Symp. Prot. Engng., September 1994, Oxford, U.K. pp. 1-8. Sowdhamini, R., Rufino, S.D. & Blundell, T.L. (1994) Recognition of a common fold: The construction and use of databases of protein domain topologies and templates. Chemtracts Biochem. Mol. Biol., 5, 291-306. Nataraj, D.V., Srinivasan, N., Sowdhamini, R. & Ramakrishnan, C. (1995) β - turns in protein structures. Curr. Sci., 69, 434-447. Sowdhamini, R., Srinivasan, N.,Guruprasad, K., Rufino, S., Dhanaraj, V., Wood, S.P., Emsley, J., White, H.E. & Blundell, T.L. (1995) Protein three-dimensional structure and molecular recognition: a story of soft locks and keys. Pharm. Acta Helv., 69, 185-192. Sowdhamini, R. & Blundell, T.L. (1995) Automatic identification and analysis of domains in proteins of known crystal structure. Prot. Sci., 4, 506-520. ** Donate, L.E., Gherardi, E., Srinivasan, N., Sowdhamini, R., Aparicio, S. & Blundell, T.L. (1994) Molecular evolution and domain structure of plasminogen-related growth factors (HGF/SF and HGFl/MSP). Prot. Sci., 3, 2378-2394. Srinivasan, N., Anuradha, V.S., Ramakrishnan, C., Sowdhamini, R. & Balaram, P. (1994) Conformational characteristics of asparaginyl residues in proteins. Int. J. Pept. Prot. Res., 44, 112-122. May, A.C.W., Johnson, M.S., Rufino, S.D., Wako, H., Zhu, Z.Y., Sowdhamini, R., Srinivasan, N., Rodionov, M.A. & Blundell, T.L. (1994) The recognition of protein structure and function from sequence: adding value to genome data. Phil. Trans. Roy. Soc. (London), 344, 373-381. ** Johnson, M.S., Srinivasan, N., Sowdhamini, R. & Blundell, T.L. (1994) Knowledge-based protein modelling. CRC Crit. Rev. Biochem. Mol. Biol., 29, 1-68. Overington, J.P., Zhu, Z.Y., Sali, A., Johnson, M.S., Sowdhamini, R., Louie, G.V. & Blundell, T.L. (1993) Molecular recognition in protein families: A database of aligned three-dimensional structures of related proteins. Biochem. Soc. Trans., 21, 597-604. Sowdhamini, R., Ramakrishnan, C. & Balaram, P. (1993) Modelling multiple disulphide loop containing polypeptides by random conformation generation. The test cases of conotoxin GI and endothelin I. Prot. Engng., 6, 873-882. Nagarajaram, H.A., Sowdhamini, R., Ramakrishnan, C. & Balaram, P. (1993) Termination of right handed helices in proteins by residues in left handed helical conformations. FEBS Letters, 321, 79-83. Sowdhamini, R. & Balaram, P. (1993) Protein structure and stability. in Thermostability of Enzymes (Ed. Gupta, M.N.) Narosa Publishing House, Delhi. pp. 2-23. **Sowdhamini, R., Srinivasan, N., Ramakrishnan, C. & Balaram, P. (1992) Orthogonal bb motifs in proteins. J. Mol. Biol., 223, 845-851. Srinivasan, N., Sowdhamini, R., Ramakrishnan, C. & Balaram, P. (1991) Analysis of short loops connecting secondary structural elements in proteins. in Molecular conformation and biological interactions (Eds. P.Balaram & S.Ramaseshan) Indian Academy of Sciences, Bangalore. 59-73. Srinivasan, N., Sowdhamini, R., Ramakrishnan, C. & Balaram, P. (1990) Conformations of disulfide bridges in proteins and peptides. Int. J. Pept. Prot. Res., 36, 147-155. ** Sowdhamini, R., Srinivasan, N., Shoichet, B., Santi, D.V., Ramakrishnan, C. & Balaram, P. (1989) Stereochemical modelling of disulfide bridges: Criteria for introduction into proteins by site-directed mutagenesis. Prot. Engng., 3, 95-103. Ramakrishnan, C., Sowdhamini, R. & Balaram, P. (1988) Analysis of short interproton distances in proline peptides as a guide in the interpretation of nuclear overhauser effects. Coll. Czec. Chem. Commun., 53, 2801-2809.